Allow people or groups to add events directly to a calendar for less administrative work. 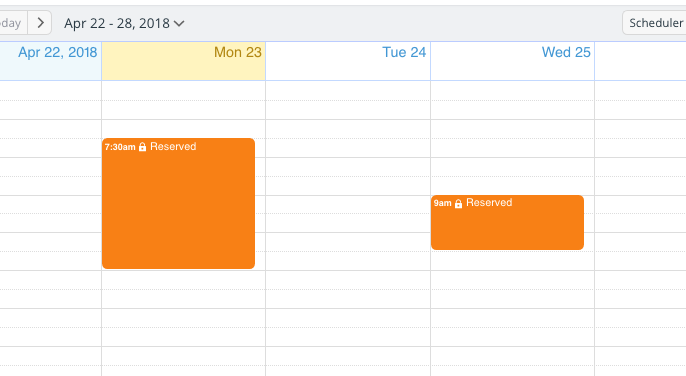 Many people love using Teamup to allow others to contribute to a shared calendar. It’s less work for the calendar administrator (always a bonus). Without Teamup, allowing others to add events to a calendar can be complex and risky. Granting full access to a calendar — so others can add events to it — risks data loss. What if someone accidentally deletes an event? The alternative is to use a hodgepodge system of emails, messaging, and collecting information via a form or spreadsheet. The calendar administrator still ends up having to manually input all the even information; the workload is increased, rather than decreased. By sharing calendars and granting permissions via unique links — with controlled, customized permissions — you avoid the back-and-forth, tedious process of collecting information and transfering that information to a calendar. All the calendar administrator has to do is review the events that people create, and make them visible to others as desired. 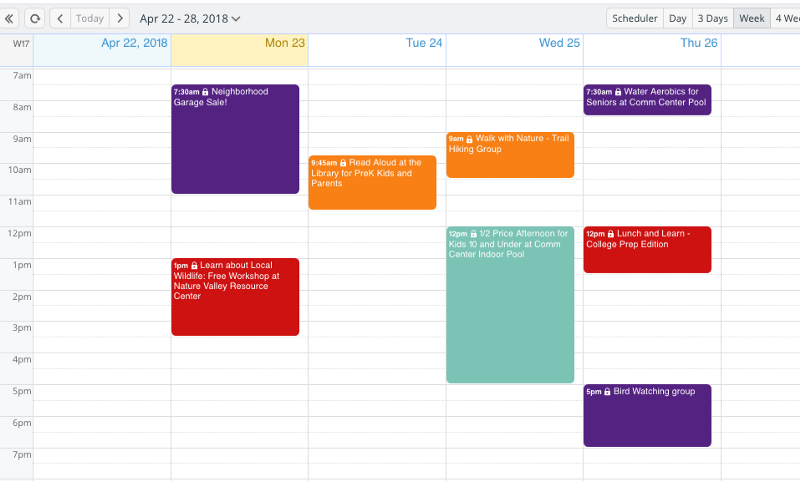 When managing content, you could allow members of the editorial team add content ideas, scheduled interviews, and industry events to the calendar. For community calendars, different community groups and organizations can add their events to the shared calendar. In a team environment, members could request meetings, or note when they are “out of the office” on the calendar. Nonprofit organizations can allow volunteers to add various tasks or needs related to an outreach or event. A small business, or a department in a large corporation, could allow staff to request time off via the calendar. These scenarios are easy to manage with a Teamup Calendar. You’ll still want to maintain some sort of control over the process. With the ‘Add-only’ and ‘Add-only, no details’ permissions, you can essentially use a Teamup Calendar as a pending event system. First, add a sub-calendar for event submissions, meeting requests, appointments, and other items you want people to create on your calendar. It could be called ‘Event Submissions’ or ‘Pending Appointments’ — whatever makes sense for your use. The top sub-calendar is designated for event submissions. Next, create a link for the sub-calendar. 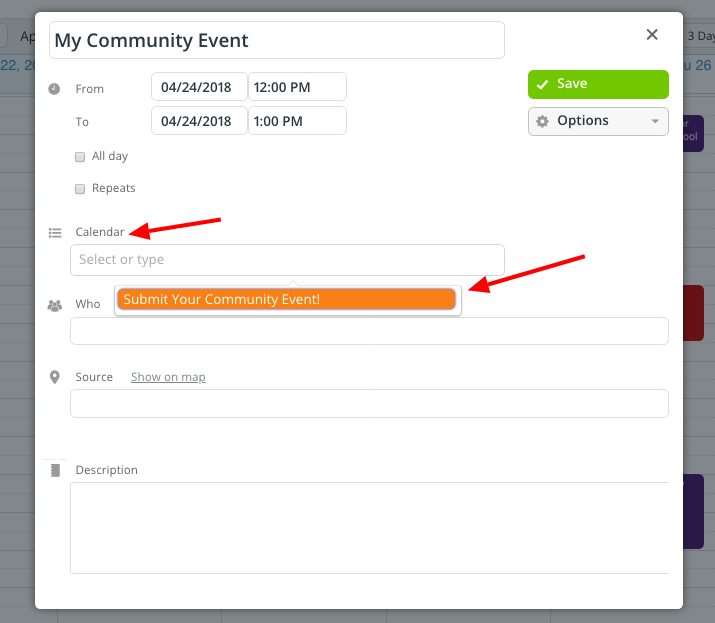 You’ll want to customize the link so you’re sharing only your calendar for event submissions, with Add-only or Add-only, no-details permission. Leave other calendars “Not Shared” to enable access only to the Event Submissions calendar. 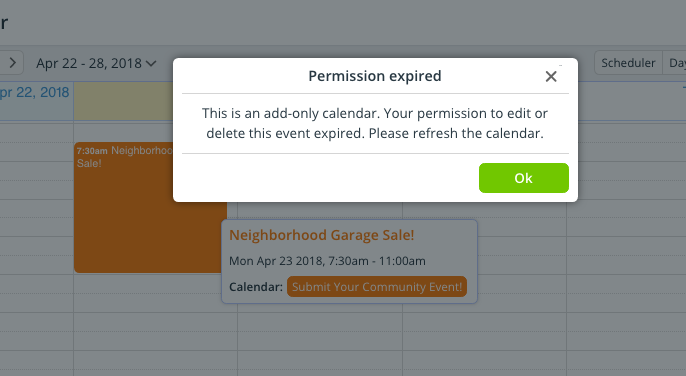 The add-only permission enables users to open the shared sub-calendar, click on the calendar to add an event, enter the event details, and save the event. They can also see other events that have been added to the calendar, including details (such as description and location) but can not edit them. Take a closer look at sharing and setting permissions. The add-only permission provides a 30 minute time to edit the event. There are many ways you can adjust this concept to make it work for your particular use. What if someone needs to see what else has been scheduled, as a reference point when they add their own event? That’s easy, too. You can adjust the link to allow read-only access to any related sub-calendars. Someone with this link can see all calendars, but only add an event to the Event Submission calendar. A person with the link above can see all calendars, but can only add events to the event submission sub-calendar. All calendar events shown with additional read-only views included. When someone with this link adds an event to the calendar, they’ll only be able to put their event on the event submission calendar. Since it’s the only calendar with add-only permission, it’s the only one that will show up and can be selected in the event editor. The read-only calendars will not be available in the event editor box. If you want to allow someone to edit the event they submitted any time later from any browser or device, you can create a link for that specific user (or group) and give it a modify-from-same-link permission. A link which allows someone to modify an event they’ve created on the Event Submission calendar. 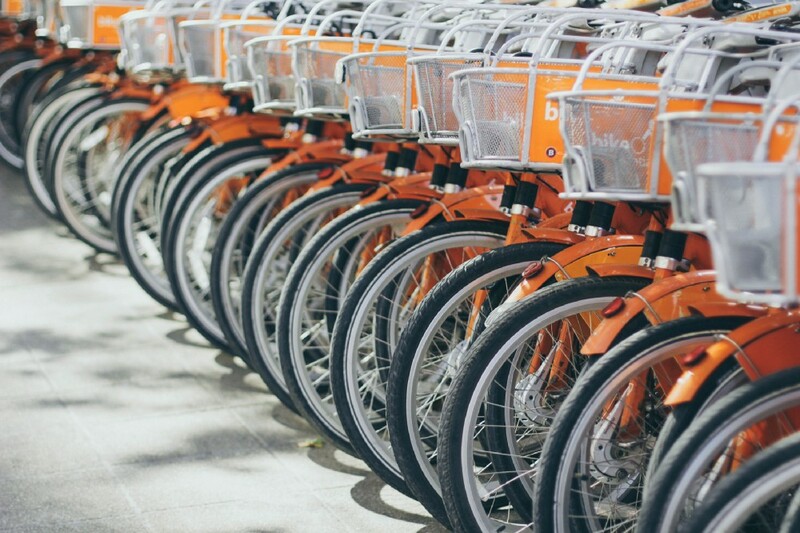 If you’re working with a specific community group, for example, that often creates recurring events and needs to update details and locations, you could create a specific link, like the one above. They can access the calendar, create their events, and modify events as needed from that link. 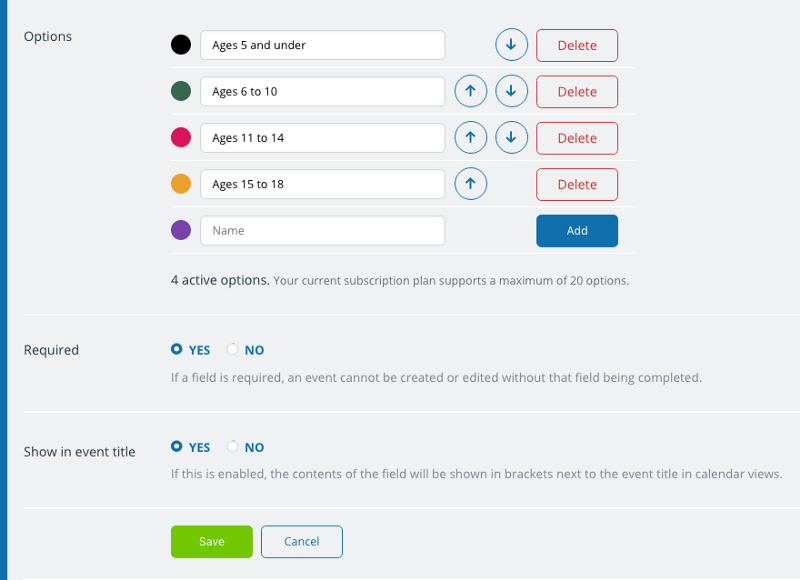 You can also customize event fields to get the right information for events that are submitted. To customize event fields, go to Settings > Event Fields. Then click on the +New Field button in the top right. You can name the event field and make it single-line text entry or insert choices. You can also make it required, and choose to have it show in the event title, if desired. 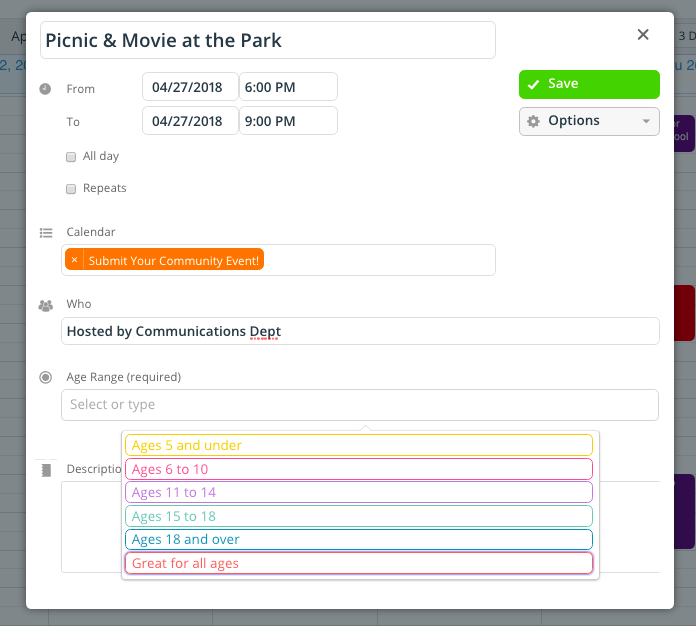 A customized event field with multiple choices. As the calendar administrator, you can log in and see all events that have been added to the calendar. You can also set up email notifications, if desired. Use Scheduler view to easily work with events that have been submitted. Simply drag an approved event from the Event Submission calendar to the correct sub-calendar. Drag-and-drop events from the event submission calendar to the right sub-calendar. How much work could you save without having to manually add all those events from a spreadsheet, or track them down in emails? Try it out and see how it could work for you with our live demo calendar.